April 29, 2010 - Derek Michael Stansberry, a U.S. citizen and resident of Riverview, Florida, was charged on Wednesday in a criminal complaint in the District of Maine with interfering with flight crew members and willfully making false threats about an explosive device on an aircraft. Stansberry, 27, a passenger on Delta flight 273 from Paris to Atlanta on April 27, 2010, was arrested yesterday after the flight was diverted to Bangor, Maine, in connection with his alleged illegal activities. Stansberry is expected to make his initial appearance in federal court in Bangor, but a time for the hearing has not yet been set. He faces a potential sentence of 20 years in prison for interfering with flight crew members and five years in prison for making false threats about an explosive device on an aircraft. The flight attendant provided the note to a Federal Air Marshal on the plane. Stansberry was then moved to the back of the plane and taken into custody by the air marshals without incident. According to the affidavit, Stansberry told the air marshals that he had dynamite in his boots, which were located in his backpack, and that a pressure plate switch would detonate the dynamite. Stansberry also allegedly stated that there were explosives in his laptop. According to the affidavit, the air marshals took custody of the laptop and the boots, placed them at the rear of the plane and built a bunker around these items to dampen the effects of any potential explosion. 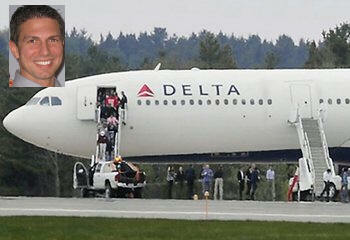 Stansberry remained in custody as the flight was diverted to Bangor. Upon arrival in Bangor at approximately 3:30 p.m., Stansberry was removed from the aircraft and taken into FBI custody. Passenger and crew were also removed from the aircraft. The Bangor Police Department bomb squad searched the entire plane and all carry-on and checked luggage. Preliminary field tests indicated traces of explosives on Stansberry’s boots and checked luggage. No explosive devices were located on the plane or in the luggage. The affidavit alleges that, after being searched and brought to the holding area at the airport, Stansberry stated that he held high-level government clearances and was in possession of classified documents. He also allegedly stated that he believed people on the plane were following him, ridiculing him and using interrogation techniques on him, although these people never spoke directly to him or asked him any questions. According to the affidavit, Stansberry said he decided to claim he had a bomb in order to divert attention from himself and the fact that he had classified information. He said he did not actually possess any explosive device and that he did not have the ability to make one. During the interview, Stansberry indicated that he had taken one Ambien earlier in the day. A report by the Federal Air Marshals indicated that Stansberry had stated to an air marshal that he had taken eight Ambien and had previously used Valium but not on this flight. This investigation is being conducted by the FBI, Federal Air Marshals, U.S. Immigration and Customs Enforcement, Bureau of Alcohol, Tobacco and Firearms, U.S. Customs and Border Protection, Transportation and Security Administration and the Bangor Police Department. The prosecution is being handled by the U.S. Attorney’s Office for the District of Maine.